You might think Kiku is just another Japanese restaurant; there are more and more of them, but this one is worth visiting when you’re looking for a decent meal around lunchtime. 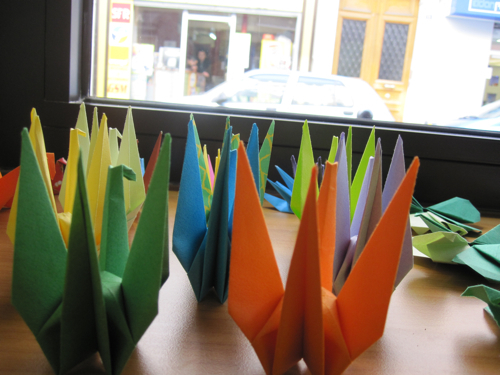 The ambiance is pretty cheerful, you dine close to your neighbour (as is the case almost everywhere in Paris) and while waiting for the food you have time to admire the origami mini-sculptures decorating the tables. The lunch menus are very tempting: You order a main – like "Beef sukiyaki with vegetables", "Tofu steaks with salad", "Grilled salmon with ratatouille" or "Tempura prawns and vegetables" – and you get: three nicely done starters or amuse-bouches of the day, a miso soup and rice on the side. You might have noticed: there's are no sushi on the menu and no red tuna. That already gives you a sense of what Kiku is all about. It's definitely not just another sushi place, but an izakay style restaurant or a kind of Japanese tapas bar. 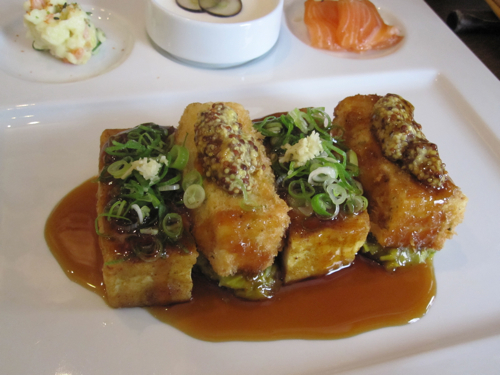 Does that makes you think of the famous “Nobu” and “Zuma” restaurants in London? Well, that’s where Kyochi Kai, Kiku's chef, left his mark after doing his training in Tokyo and Sydney. 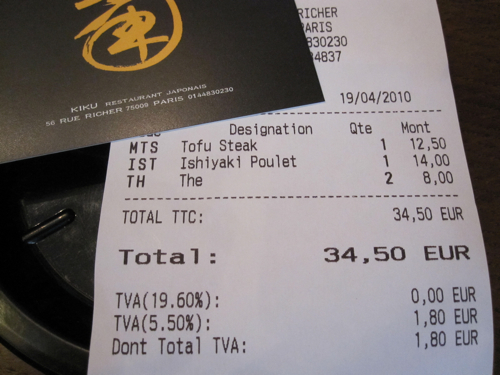 For around 15 Euros (18 US$),it's hard to find better lunch in Paris.